Multi-purpose control valves and high-precision control valves for steam with a pressure reducing valve as the base. Can be used for a variety of types of control when combined with a controller. Control valves and controllers automatically maintain pressure, temperature, etc. at the target value. Automatic multi-control valves consisting of pilot-operated pressure reducing valves. Together with TLV's reliable controller, valves maintain accurate control at the target pressure, temperature, etc. Electro-pneumatic control valves for steam process or general use. Valves for steam process use are equipped with a built-in separator and steam trap. Also includes self-acting temperature regulators for general steam applications. 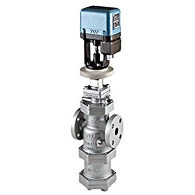 The product lineup includes high-precision control valves for steam (with integral pressure reducing valve), multi-purpose control valves, and self-operated temperature control valves that require no electricity. Multi-purpose controllers as well as specialized MC-COS controllers.